Use our MailChimp integration to automatically send visitor form data to MailChimp. Assign a MailChimp List to a page to create new list members when a form is submitted on your page. 3. Find MailChimp in the list of integrations and click the blue Integrate button. 4. 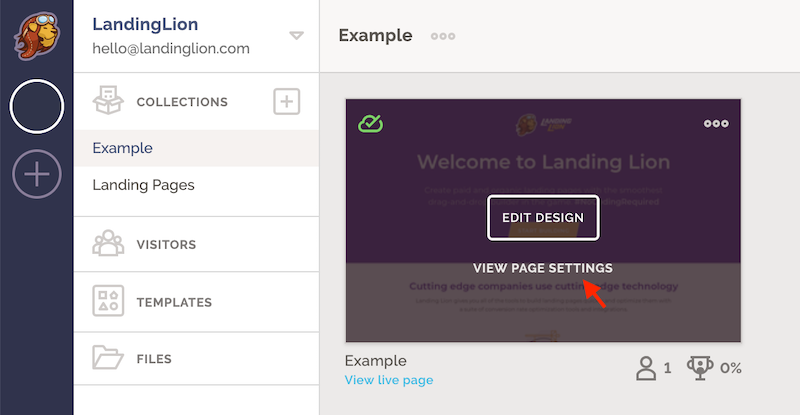 In the pop-up log into your MailChimp account to finish authorizing MailChimp with your Landing Lion account. ⚠️ If you do not see the popup, make sure it is not being blocked by your browser. 5. Find MailChimp in the list of integrations. 6. Assign a MailChimp List to this page by clicking the input field then typing or selecting the name of the List from the drop-down. Now all visitor form data from that page will be added as members to your MailChimp List(s). By default, only email and name fields are sent to your MailChimp Lists. Map the form fields from your page to Merge Fields in your List and record more data. 1. For instructions on how to create merge fields for your MailChimp List visit MailChimp's documentation. ⚠️ Note: Only Text Merge Fields are supported. 3. Under Workspace Settings click Integrations. 4. Find MailChimp in the list of Integrations. 5. Click "Map Form Fields". 6. Create a Form Field Mapping for each MailChimp List you are going to use.